The Russia backed Syrian regime of Bashar al Assad dropped a barrel bomb containing poisonous chemicals on civilians in eastern Ghouta, killing dozens and injuring hundreds of people people, reports said Saturday. A chemical attack on a rebel-held town in eastern Ghouta has killed dozens of people, medical services reported Sunday, with US President Donald Trump warning Syria’s Bashar al-Assad that there will be “a big price to pay”. The Syrian state denied government forces had launched any chemical attack and Russia, Assad’s most powerful ally, called the reports bogus. A joint statement by the medical relief organisation Syrian American Medical Society (SAMS) and the civil defence service, which operates in rebel-held areas, said 49 people had died in the attack late on Saturday. Others put the toll even higher. The Russian Foreign Ministry warned against any military action on the basis of “invented and fabricated excuses”, saying this could lead to severe consequences. The United States launched a cruise missile strike on a Syrian air base last year in response to a sarin gas attack in northwestern Syria blamed on Assad. In one video shared by activists, the lifeless bodies of around a dozen children, women and men, some of them with foam at the mouth, were seen. “Douma city, April 7 … there is a strong smell here,” a voice can be heard saying. Douma is in the eastern Ghouta region near Damascus. Assad has won back control of nearly all of eastern Ghouta in a Russian-backed military campaign that began in February, leaving just Douma in rebel hands. Facing military defeat, rebel groups in other parts of eastern Ghouta have taken safe passage to other opposition-held areas at the Turkish border. Until now, Jaish al-Islam has rejected that option, demanding it be allowed to stay in Douma. Syrian state media said on Sunday a deal had been struck under which Jaish al-Islam would finally leave for the town of Jarablus after saying the group had asked for negotiations. There was no immediate comment from Jaish al-Islam, which has been one of the most prominent insurgent groups in the war. A pro-Syrian opposition TV station, Orient, said earlier talks were under way between Jaish al-Islam and Russia to reach a final settlement for Douma. 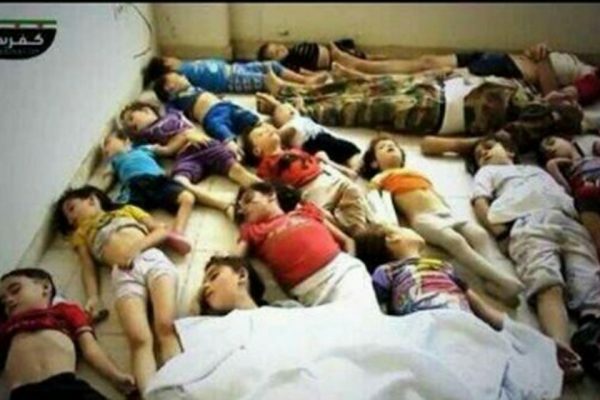 Syrian children reportedly killed in the April 2018 chemical weapons attack. President Trump tweeted early Sunday morning, “Many dead, including women and children, in mindless CHEMICAL attack in Syria. “President Putin, Russia and Iran are responsible for backing Animal Assad. Big price to pay,” he wrote. 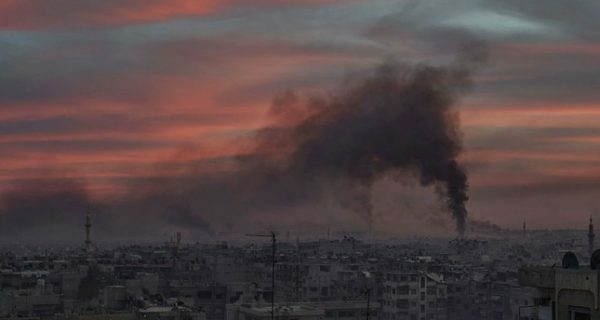 The Syrian Observatory monitoring group said it could not confirm whether chemical weapons had been used in the attack on Saturday. Observatory Director Rami Abdulrahman said 11 people had died in Douma as a result of suffocation caused by heavy bombardment. Medical relief organisation SAMS said a chlorine bomb hit Douma hospital, killing six people, and a second attack with “mixed agents”, including nerve agents, had hit a nearby building. Basel Termanini, the US-based vice president of SAMS, which operates medical facilities and supports medics in Syria, told Reuters another 35 people had been killed at a nearby apartment building, most of them women and children. The joint statement from SAMS and the civil defence said medical centres had taken in more than 500 people suffering breathing difficulties, frothing from the mouth and smelling of chlorine. One of the victims was dead on arrival and six died later, it said. Civil defence volunteers reported more than 42 cases of people dead at their homes showing the same symptoms, it said. Syrian state news agency SANA said Jaish al-Islam was making “chemical attack fabrications in an exposed and failed attempt to obstruct advances by the Syrian Arab Army,” citing an official source. “We have received reports of many people killed and injured in Duma in the past 24 hours. We continue to be extremely concerned for people who remain in Douma who are being subjected to escalating hostilities,” UN Office for the Coordination of Humanitarian Affairs spokeswoman Linda Tom said. But Assad said this is fake news. Your day will come and all the ones who tortured the innocents no matter who they are. God is watching and he and others will burn in hell. Ok where are our local Hezbollahs to claim there is not a shred of evidence and blame all the gas attacks on rebels that do it to themselves over and over again? Assad thinks things can go back to the previous brutal dictatorship like nothing ever happened. There will be no peace in Syria until Assad is dead or exiled, simple as that. He has way too much blood of his own people on his hands to think he can ever have real legitimacy again, as legitimate as a brutal dictatorship can be. The problem is not Assad or his family per se. The problem is the culture that begets one Assad after another in the Arab world.